The game has gain a lot of improvement from we start. Right now, we try to focus the game in one map and we choose with the Egypt map. The programmers already built the mechanics for the game like we decided to put final boss in the map, and the enemy will come in 3 different type. Furthermore, we have concern with the time, so we only focus to develop one playable character, and the other only the design and concept. I think with the the mechanics right now, it is already provide a good experience for the game. In my opinion, when we try to combine to different type of game in to one game, it will increase the game difficulty that is why, it will be very good to keep the game simple and not put a lot of mechanics or new mechanics into the game. 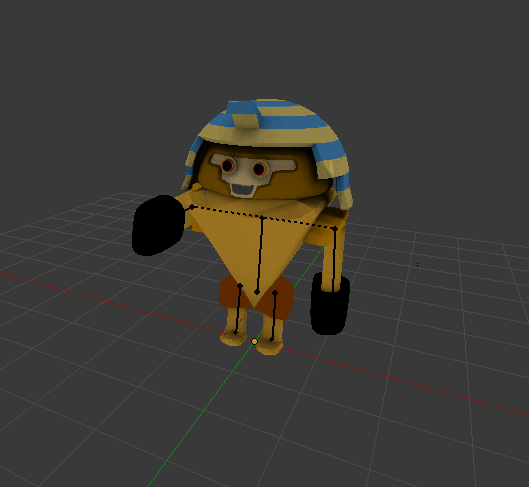 Right now, I am working to make the model of the small enemy and put animation into that model. And also I working to animate other models especially the final boss and the crazy girl character. This is my first time working with blender to animate the model, I think this is quiet interesting and challenging experience, for example when build the model itself, it already take a lot of time to build and right now to make the model move like what we want is more challenging but i believe at the end it will feel good when you see the model can move.